Rehoboth Beach– On Monday August 8, 2016, troopers were called to the Aeropostale Outlet (Surfside) located at 4565 Coastal Highway, for a reported invasion of privacy complaint. Troopers made contact with 14-year -old female victim who reported that someone had placed a cell phone under the door of the dressing room in which she was changing and took a photo, according to police. Police want to speak to the man pictured in the photo above. 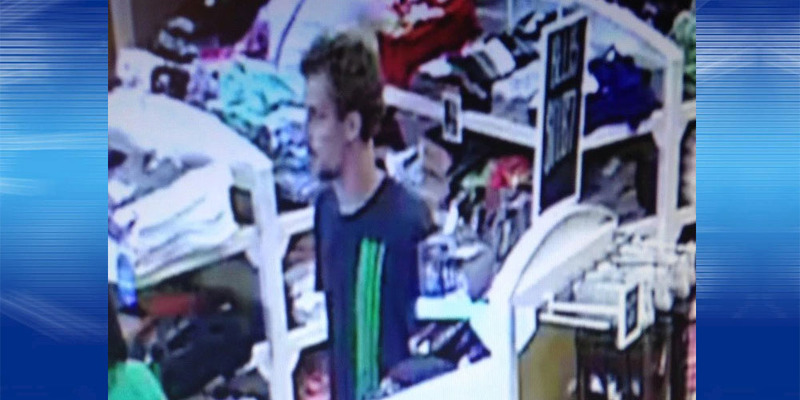 Police say the suspect depicted in the surveillance photos is a white male, 20-30 years of age, 5’07”-5’10” tall, brown hair, wearing a blue T-shirt with green writing down the side, black shorts, and black sneakers.